Among the crazy things I love doing is getting away, be it within my own city (a “staycation” as they call it) or within relative close distance of my home town, Vancouver. I recently stayed at the Magnolia Hotel, a boutique hotel located in downtown Victoria. In fact, I enjoyed my visit so much that I came back for a quick overnight visit recently, and I brought along my mom. You may remember that I also enjoy trying to provide opportunities for my readers to taste things that they might not think or plan to enjoy themselves. Thanks to the kindness of many of my partners in the industry I’m able to offer “staycations” and getaways, and this time I’m partnering with the awesome folks of the Magnolia Hotel to offer you an opportunity to win a weekend holiday getaway. The prize package consists of 2 nights accommodation at the Magnolia Hotel, $100 credit for the Magnolia Hotel spa and free parking (in case you decide to drive into Victoria). This prize pack should give the lucky winner a nice opportunity to enjoy the many things that you can do in the capital city of British Columbia. Told @hummingbird604 my favorite activities in Victoria to enter to win a wknd getaway @MagnoliaHtl http://is.gd/bYIoei Which are yours? The Parliament buildings. Photo credit: Derek K. Miller on Flickr. I will draw a random winner on the next Travel Tuesday (August 9th, 2011 at 2pm). I will inform the winner by email and on this post. *The winner must provide their own transportation to Victoria. 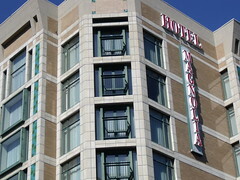 You can follow the Magnolia Hotel on Twitter and on Facebook as well as on TripAdvisor. When I’m in Victoria I love to stop at the Bengal Lounge at the Empress Hotel for an ice-cold beer right in front of the mounted tiger. After that I like to hop aboard a boat and head to Fisherman’s Wharf for a little levity. The government buildings are always a draw and so are the merchants sellling their wares along the waterfront. I love love love Victoria! I went very many years ago now. My favourite was always to visit the Madame Tusauds wax museum and of course just mill around the harbourfront. My favourite thing is to play frisbee in Beacon Hill Park! There are so many great things to do in Victoria. A few years ago we rented a scooter and rode around the city for 3 days. So, so much fun and what a beautiful coastline all the way around the city. A breakfast visit to Lady Marmalade and beers at Canoe are among my favourite things to do in Victoria! I live in Victoria but I want a “staycation”! I just finished three weeks straight of work so could use some R & R… My favourite thing to do in Victoria this time of year is literally wander. The city comes alive this season so whether it’s boutique shopping, watching the buskers on the inner harbour or eating at one of the many great restaurants I’m in heaven! Tourist in your own town? Yes please! I love just walking around the harbor area and looking at the beautiful scenery. I also love checking out all the little vendors that are in the area. With a lot of family in Victoria, I’ve plenty of things to do on the rare occasion I get to visit. One of the favorites is heading to Canoe Pub, sitting out on the patio and enjoying one of their Microbrews. It’s also lovely to grab a picnic lunch and head to Dallas Road to watch kites and families strolling around (and if you’re lucky, hang-gliders!). Breakfast at John’s Place, oysters at Ferris’ and a visit with my brother and his wife, who I don’t see nearly often enough! I love showing newcomers and visitors around, and seeing my city through their eyes. It makes it fresh and new, every time. my favourite activity in victoria is EATING! there are so many good restaurants: like herandez, cafe bliss, mole, pizza pi… the list could go on. i also like just walking around – it’s a well laid out and easily walkable downtown core. it’s a shame to stay that i’ve never visited victoria before, so this would be the perfect opportunity! the parliament building would definitely be one of my stops. My favorite thing to do is to hike Mt. Doug! I love to walk along the waterfront, visit the Parliament Bldg and its gardens. Victoria is a beautiful city with many hidden treasures to discover. When I travel there I usually stay at the Magnolia Hotel and walk the downtown core, take in the art galleries, boutiques and spralling waterfront. My favourite restaurant to visit is Pescatores Fish House and order the seafood dinner for 2…amazing! Simply walk and enjoy what Victoria is known for. It’s been years since I’ve been to Victoria, but I’ve never actually done the high tea thing at the Empress. I love going to Victoria! My best friend lives there so I love going there to visit her and her huge family. I also really enjoy strolling along the Inner Harbour, walking around the Parliament Building, and shopping in the little boutique stores all around downtown. My bestie and I also really enjoy shopping and eating in Chinatown (a little known gem in my opinion). I want to go to Rebar! Despite having been to Victoria several times, I’ve never been to Rebar – I always seem to forget about it when I’m actually there! My favourite thing to do in Victoria is eat! I love checking out new restaurants and seeing what the foodies are talking about over there! Another thing I enjoy doing in Victoria is going to the Royal BC Museum. I love Victoria! When I’m there I visit my sister, who studies at UVic, and like to visit the vintage stores downtown or do some bunny spotting on the university campus. I haven’t been to Victoria in about 10 years. This time around I’d like to visit Craigdarroch Castle and Butchart Gardens. I’d also like to dine at Il Terrazzo, which is named as Victoria’s Best Italian Restaurant by locals. I’d also like to visit the Royal BC Museum to see new exhibits. I have been to Victoria many times because my inlaws live there. I love the little boutiques along Government st. and walking along the inner harbour. My favorite thing is to just walk around Victoria, and go to Oak Bay and see the seals in the marina. I also love doing various cultural activities. It’s been years since I’ve been to Victoria! One activity I would like to do in Victoria is see my sister for a couple hours! She works on a cruise ship and they’ll be docking in Victoria every Saturday until Sept.
I’ve only been to Victoria once, on a school trip in elementary school!! We toured the Royal British Columbia Musuem and I’m sure some other things as well, but my memory is fuzzy! I would love to visit again and have tea at the Empress. I love Victoria! It is so beautiful. I love Beacon Hill Park and having tea at the lovely tea houses. Lovr Victoria and my family that live there!!! I was born & raised in Victoria but have lived up island for 26 years. I love to visit my hometown and when I’m there I do a little shopping in downtown, visit the Fernwood Inn (my old stomping grounds), visit friends & family, and make sure to spend some time along the Dallas Road waterfront. On my next trip, I hope to catch up to a certain artist on the causeway and take in a play at the Belfry, and of course, the very best place to stay is the Magnolia, which I know from personal experience!!! I love Victoria and all it has to offer. Be it a local (as I am) or as a visitor. 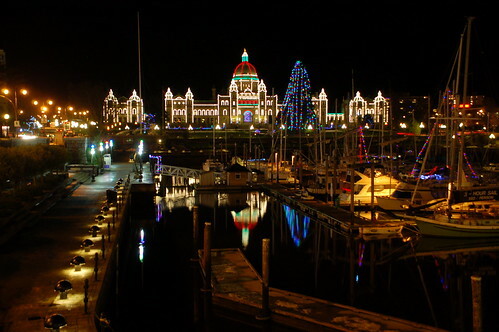 Must see places are the Museum, the Empress and the Leg all lit up at night, or if you are visiting at Christmas try the trees in The Empress Lobby and the Teddy Bears at the Hotel Grand Pacific. Victoria is a beautiful city and I don’t get there often enough even though I live on the island. I always take in the Provincial Museum and stroll along the inner harbour. Some day I hope to do High tea at the Empress! We used to go to Hugo’s (in the Magnolia Hotel) every time we visited Victoria, that’s where I first started liking beer. It was their Ginseng beer…they have another one with hints of chocolate. Anyway…I love Beacon Hill Park, Fisherman’s wharf, having tea and treats at the bakeries in Oak Bay, the parliament buildings at night, James Bay & Cook Street Village. The sea wall around the inner harbour, the great restaurants, Tuesday night specials at Hugo’s, the lounge at the Laurel Point in with a view of the Parliament buildings at night. The seals and float houses at Fisherman’s wharf, Cook St Village, James Bay, the bakeries at Oak Bay, walking through Beacon Hill Park, the Parliament Buildings at night and the inside tour during the day. Ive never been to Victoria but have heard from so many how beautiful it is! A sunny walk along the waterfront with an icecream, my lovely man and the architecture to entertain me would be a dream come true! Barb’s Fish and Chips, the BC Museum, walk on the breakwater, rice and gravy at Japanese Village, the Rogers soda shop, and the petting zoo in the park. I haven’t been in years, but I’d love to go back! When I am in Victoria I love to have lunch at Willie’s Bakery. I enjoy browsing the antique shops looking for interesting old postcards which have been written on and are stamped. I grew up visiting Victoria often, and while Fort Rodd Hill, Beacon Hill Park and the lovely drive along Dallas Road should not be missed, these days I am a bigger fan of going for coffee in the Cook Street Village, or oysters and Pimms at the Irish Times. Delish! I have kids so when we go down we usually visit Beacon hill park and the petting zoo and the Royal BC museum….The inner harbour is always a great thing to do to. Living in Victoria is great and I would love a “staycation!” Fave things to do at this time of year would be to check out one of the many beaches, or enjoy a cold beer on one of the many patios! Wax museum! They look so real it’s eerie. I would love to visit Victoria, get all dolled up and take my 4 year old daughter for High Tea at the Empress. Everything is new when you see it through the eyes of a child. I’d love to romance my wife in Victoria. We live on the island but have been so busy with our young kids that we haven’t explored Victoria. A moonlit walk around the harbour, a carriage ride and a late night dinner at the Prime Steakhouse. Top it all off with a night of luxury at The Magnolia! There are so many activities to enjoy in Victoria! When I’m there, it’s usually to meet with my very best friend, who I don’t get to see often enough. We LOVE to go for long, FAST walks along the Inner Harbour and over into Esquimalt, or along the beautiful waterfront of Dallas Road. We use that time to try and “catch up” on what we’ve been doing since we last got together. If our schedules allow, we’ll stay overnight, and talk into the wee small hours of the morning. We have yet to stay at the Magnolia, but it looks lovely, and I’m sure we’d enjoy it! Victoria is where I would love to retire! We try and visit as often as we can but I must say we have never stayed at the Magnolia and I must say it looks wonderful. We are heading to Victoria in September and I will be checking out the Magnolia for sure! I Love Victoria. I have to say, my favorite time to visit Victoria is right before Christmas! I enjoy the carriage rides through downtown. High Tea at the Point Ellice house (don’t miss the tour of the house here! ), walking around in Oak Bay, Beacon Hill Park, and lots of Dim Sum! Ok, want to go now. A wander around my partner’s old haunts, and visiting the family. He grew up in Victoria and we always enjoy driving around and going for walks in various neighbourhoods as it brings out the kid in him. I love Victoria, and try to get there at least once a year. Must do’s for me include: watching the goat stampede at Beacon Hill Park, and getting a cone from the Beacon Drive Inn. Strolling aong Clover Point, watching dogs play and paragliders. Heading down to Fisherman’s Wharf for some chowder and seal feeding, and hours and hours of watching the open water. Heaven on earth!! I really enjoyed Victoria and Vancouver Island and happened to stay at the Magnolia on a quick two day one night visit with my father about a year ago. My Dad was visiting from Ontario we decided to take a quick road trip on his visit and decided to take the ferry to Nanimo and then drive down the coast to Victoria. I made a reservation at the Magnolia hearing from a friend that it was an amazing place to stay. (it was!) It also happened to be the Taste of Victoria event which was amazing my Dad and I where able to have a great steak at Ric’s Steak House and a fantastic nights rest at the Magnolia Hotel. Would love to spend more time in Victoria out of the car exploring the streets and restaurants, it’s an amazing city. Been a while, but I went to The Butchart Gardens & had some tea! Good times…two nights in the city would be fantastic! Hop on the Victoria harbour ferry, walk around downtown, check out a few of my fave (local) stores, rent scooters, go for a walk around the harbour in the evening! want to checkout DT Victoria! Victoria’s amazing! I love it the more I visit. My favourite activities – flying in via Harbour Air. Going for a walk along Government Street to Bastion Square then Fan Tan Alley. Walking up Fort Street to Cook Street, dropping by Moka House for a coffee, and then meandering along the beach at Dallas Road. Having fish & chips at either Barbs or Red Fish Blue Fish… then strolling through the residential streets behind the Parliament Building (past Emily Carr’s House) – magical! Despite living in Vancouver, I very rarely make it over to Victoria and would love an opportunity to visit friends and relations I only get to see once in a while. My favourite Victoria-area activities involve the Royal Museum of Natural History, chowing down on some amazing veggie Chinese food at Lotus Pond, and if I’m lucky, getting out to Sooke for a dip in the amazing potholes! I’d love to go for High Tea at the Empress and the Royal BC Museum. I absolutely love Victoria. First there is a great ferry ride to get there complete with a chance to perhaps see some whales then there is a charming city loaded with activities. I love to walk around the inner harbour. The Empress Hotel and the parliament buildings are beautiful (especially at night). Shopping is wonderful. I can never get enough of Victoria. I wear out a lot of shoe leather in Victoria because I love to walk the neighbourhoods–Cook St Village, Chinatown, the Inner Harbour, Fort Street…all that walking makes me hungry, so to fortify myself I treat myself to nibbles at the many wonderful neighbourhood shops along the way. I used to live in Victoria years ago. I loved the scuba diving there and would definitely do it again during a visit. I’d also spend a lot of time catching up with old friends and enjoying the food and coffee scene. I absolutely love Victoria. It’s my favorite place to go when I need a vacation. It’s also the home to many of my relatives that I only get to see once every few years. It always feels like going back “home” when I get to visit there. There are still many things I haven’t been able to do there though, like go for High Tea. One day I will go there just for High tea! I’m sad to see the wax museum go. My favorite part of Victoria is the harbour. I also love watching all the cruise ships go in and out. I haven’t been to Victoria too many times, but I would like to see the amazing lights that are featured in your photo, and get a chance to really walk around the downtown area to explore the different attractions and restaurants. It’s been years and years since I’ve been to Victoria. I’d like to check out afternoon tea at the Empress and the city’s best restaurants. I used to live in Victoria and still visit it often. I like walking around downtown and also visiting Langford (a suburb of Victoria) for shopping, lakes, and for nice walks (as there is still a lot of forestry and greenery around there compared to Victoria). I love Victoria! I especially like Beacon Hill Park! It is so amazing! I also like checking out the nice seafood places downtown by the water – Yum! When I visit Victoria, I love seeing my friends who have relocated there for work, sitting on the lawn of the parliament building and having some drinks on a patio by the harbour. Victoria is my favourite city in the world. When I am there, I make sure to go on long walks around the harbour and along the breakwater near Dallas Road. I also think Victoria has some of the best brunch spots in the world, so I do spend a lot of time thinking about where I want to eat breakfast! Of course, no visit would be complete without checking out some of the boutiques on Johnson St. So quaint! My favourite Victoria Experience is a long walk in Oak Bay. Love to imagine myself curled out in those gorgeous homes reading a great book! I always love to go to Barb’s fish at the pier and then take the water taxi across the way. If I go back I would love to take one of the walking architecture tours and go through the parliament building. I also want to go to the Pizzeria Prima Strada. (@kathygko) I don’t think I’ve ever properly visited Victoria before and I would visit the Butchart Gardens and have high tea at Fairmont Empress. I have never visited before but I would just love to take my daughter to Buchart Gardens on a saturday night to see the firewords with a picnic surrounded by their lush gardens. I would also try out the carriage ride through the city, the glass bottom boat tour and a whale watching excursion. Actually I’ve never seen the ocean in person so I would spend most of my time either swimming in it or close to it in some way. Thank you for the chance to win such an amazing prize package – good luck everyone! Used to live in Victoria – loved the July 1 fireworks and walks along Dallas Road! really enjoy walking by the water – oak bay marina and dallas road are beautiful in the evenings – also liked going to Barbs Fish and Chips – wonder if it is still there? I have been to visit Victoria a few years ago, but it was a very short trip and didn’t get a chance to see much. I would love to go there again with my wife. I love strolling through the city and taking in the old architecture. Red Fish Blue Fish in the inner harbour. No, really. BEST sustainable fish shack ever. Oak Bay marina – at dusk – lovely! I want to see whales. I have only been in Victoria once for a visit to take in the Canada Day activities a few years ago. Would definitely like to go again to check out more of the city. Great contest, Raul!